The match consists of a determined number of three-minute rounds, ranging between nine and 12. The fight is controlled by a referee who works within the ring to judge and control the conduct of the fighters. He/she rules on their ability to fight safely, count knocked-down fighters, and rule on fouls. A fighter can win by either getting the most points, or having knocked out his opponent. This involves the referee counting back from ten to one, and if the fighter’s opponent has not got back up, he is ruled out of the game, unconscious or not. The boxers must follow all rules in the game otherwise they risk being punished. 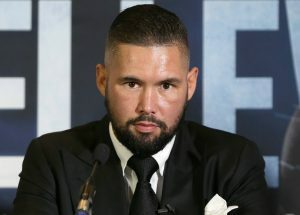 Tony Bellew faces Oleksandr Usyk in what was an enthralling match-up. There are several different kinds of betting in boxing, and we’ve broken down the lingo for you in our boxing betting guide, in order for you to place the perfect bet. Bout betting: Otherwise known as an outright winner bet, bout betting allows you to wager on either participant to win outright but also provides a draw option. Round betting: This type of bet is slightly more complicated; it offers the chance to pick not only who will win, but also which round they will triumph. If the outright odds are low, this is the perfect secondary market to opt for as it provides added heat to the match predictions. Round group betting: Similar to round betting, this offers a little more leeway when it comes to picking which round the winner will be decided on, and is often preferred by betting tipsters as choosing the exact round is often very tricky. Method of victory: This allows punters to choose exactly how they think the match outcome will be decided, whether that be straight knockouts, technical knockouts or disqualification. Fight to go the distance: Pretty self-explanatory- this requires a simple yes or no bet on whether the fight will last the full 12 rounds. Given that this is a risky wager to bet on, we’d do our research on the participant’s recent form before placing any bets. Over/under rounds: This wager allows you to pick whether the fight will last more or less than a specific number of rounds. With so many different bets on offer, it can be easy to get caught under the sheer amount of choice and buckle under the pressure. Don’t bet on every fight on the card: If you’re serious about boxing betting, then a key bit of advice is not to bet on every single fight. Keep to the odds and predictions that you are clear will reap the most amount of money. Look for the most valuable bets: Whilst it may be tempting to tip your favourite boxer every time fight week spins into view, what can sometimes be better value for money is looking for the bets that nobody else will be punting on. Follow all the news: In order to place the perfect bets, there is only one way to ensure you have the best understanding of odds coming into the fight and that is through research. Follow all the news, go online onto mainstream boxing sites, and keep up to the date with everything posted by your favourite tipsters to get ahead of the game. Check the stats: Comparing key pieces of information prior to the fight, such as previous punishment received or sparring abilities will add an extra dimension to your understanding of who will win – giving you the knowledge to punt on the right boxer. Coaching is key: More often than not, the coach is just as important of a contributor to the odds as the actual boxer. There have been many famous coaches down the years who have an impeccable track record in developing top class fighters, so it’s always worth checking out before placing a bet (after reading our Boxing betting guide, of course). Maryam is a female football writer, who grew up playing a wide variety of sport. She slowly became converted as a lover of football around the age of 10, and her interest in it drove her to pursue it not only physically, but also academically. In her first year of college she cemented a placement at the Independent, whom she worked for before branching out to Premier League-accredited sites like the female-led 'Offside Rule' blog and RealSport. She studied English at University alongside this, and is now a digital copy-writer and editor, specialising in sports journalism.